With the October 2018 Update, Windows 10 is more useful and secure than ever, introducing features that could genuinely save you time and frustration as well as focus on work. Of course, there’s always room for improvement, but Windows 10 is better than it has ever been and continues to evolve with a slew of constant updates. Anyone who’s been following Windows closely over the years has likely noticed that Microsoft isn’t releasing new versions of Windows like it used to. Rather than issuing completely new versions of Windows every few years with radical changes, Windows 10 was launched as a platform, where smaller, but tangible semi annual free updates became the norm. And, this new approach is working out well. Windows 10 hasn’t just taken Windows 7’s mantle as the most popular operating system: it’s exceeded 800 million users – getting closer to that one billion mark with every passing day. This is thanks to the constant updates, the most recent of which being the Windows 10 October 2018 Update, though the Windows 10 May 2019 Update is close behind. Windows 10 is more than just the sum of its updates, though: it’s morphed into different spin-offs for all kinds of different hardware. For example, Windows 10 S Mode locks the OS down, and doesn’t allow users to install anything not found on the Microsoft Store. That may sound restrictive, and it definitely is, but it may just be the best approach for low-end hardware and inexperienced users. In fact, all the signs point to Microsoft continuing this approach with Windows 10 Lite. There are even rumors that Microsoft is working on an even more trimmed down version of the operating system – Windows 10 Lean Mode. We’ve also seen rumblings of Windows 10 for foldable devices. This review pertains to the Home and Pro versions of Windows 10. For detailed Windows 10 system requirements and the various versions, check out the Microsoft website. All of these spin-offs and updates have helped to make Windows 10 the most modern operating system out there – bringing features and support that go way beyond the traditional PC. 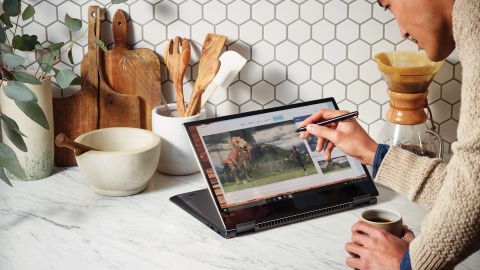 If this sounds like it’s up your alley, and you want to pick up a Windows 10 license for yourself, you can find the Home Edition for $139 (£119, AU$199) and Windows 10 Pro for $199 (£219, AU$330). However, you can find downloads of Windows 10 Home Edition for just $99 in the US if you look hard enough. We’re going to first dive into the major beats of the most recent Windows 10 update, then we’ll help you decide if Windows 10 is worth the price of admission. Now that the Windows 10 October 2018 Update has been out for a while, there are some brand new Windows 10 features that do make the OS better. Even if there have been (and still are) some October Update problems, there’s still a lot to love. So, we’re going to break down the most important features and updates in the Windows 10 October 2018 Update. If your day looks anything like ours, you probably copy and paste about a million things a day. Luckily, Microsoft made that easier for everyone with the latest Windows 10 update. In the October Update, you’ll have access to a Clipboard History that’ll keep track of everything you’ve copied. All you have to do is hit Win + V, and you can access a variety of different items you’ve copied – which saves a ton of time. But, that’s not the only Clipboard feature in the Windows 10 October 2018 Update. We’ve also got the Cloud Clipboard, which will sync your Clipboard across different devices. This means you can save time, even when you’re using multiple Windows 10 devices. With the Windows 10 October 2018 Update, there is way more compatibility with your phone – as long as you’re an Android user. Natively within Windows 10, you can now add photos from your phone, respond to messages and so much more. Finally, Windows 10 and Android users have access to some of the cross-platform capabilities that the Apple ecosystem boasts with macOS Mojave and iOS 12. Experiencing issues with the latest version of Windows 10 you just can't figure out? Check out our guide on the top Windows 10 October 2018 Update problems and how to fix them! Microsoft has killed the Snipping Tool that we all know and love in the October 2018 Update, replacing it with Snip & Sketch – which is much better. Instead of having to open a program, hitting Ctrl+N and dragging a square over what you want to capture, you can just hit Win + Shift + S to immediately jump into a partial screenshot. You can use a traditional box, circle or even draw a custom shape. Your screenshot will immediately go to your clipboard, too, saving a ton of time. It’s a huge improvement, and an example of Windows 10 adopting some of macOS’ best features. One of the biggest problem with Windows 10, or any modern desktop OS for that matter, is the sheer amount of clutter that can build up on your hard drive over time. Luckily, the Windows 10 October 2018 Update has a fix – Storage Sense. This awesome new technology will automatically archive old, unused files in the cloud, while getting rid of local files. This is a great middle ground between archival and free disk space, as you still have access to all the files that have been uploaded to the cloud. One of the headline features of macOS Mojave was the iOS News app getting ported over to the desktop, and Microsoft has followed suit with a revamped Windows 10 News app. This handy little news aggregator will collect all your news in one curated location, that you can customize however you want. The bonus? It looks amazing. Windows 10 has had a Dark Mode for years now, but for some reason File Explorer was stuck with its all-white color scheme. Luckily, the Windows 10 October 2018 Update is here to save our eyes. Dark Mode has finally been implemented for File Explorer, and it looks great – especially if you’ve had Dark Mode enabled this whole time like we have.